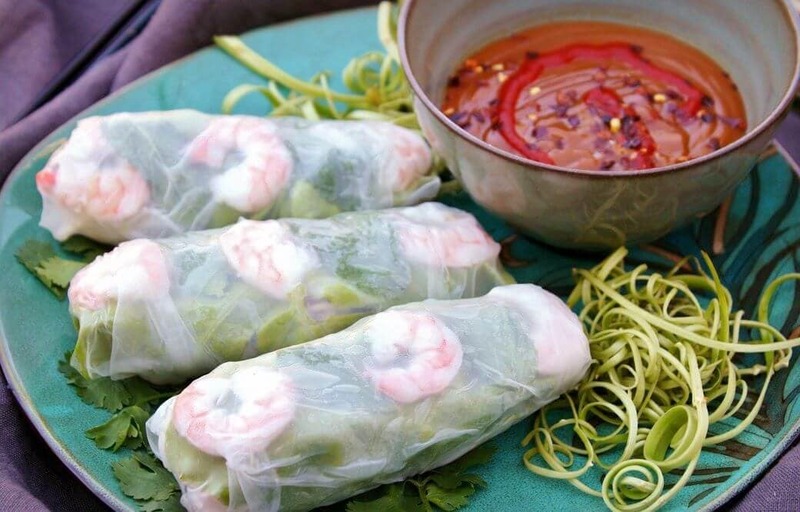 Vietnamese Shrimp Salad Rolls are so fresh and healthy. They’re easier to make than you think…you’ll be rolling in no time! Served with a completely addictive authentic peanut dipping sauce. My Vietnamese Salad Roll addiction is no joke. I crave these almost every day, especially in the summer. 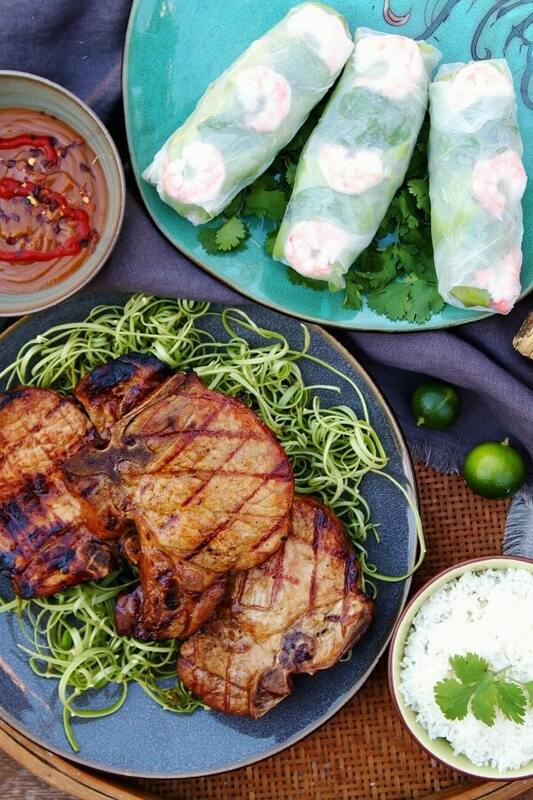 For a super fresh meal on a hot summer day pair serve them alongside these Vietnamese Grilled Beef Vermicelli Bowls or with Lemongrass Marinated Grilled Pork Chops. All three dishes are super quick to make once you have the ingredients prepped. The Salad Roll technique is a bit challenging at first, but practice makes perfect. Soon you’ll be a master! Salad Rolls are cold Vietnamese hand held appetizers which consist of fresh ingredients rolled together into a large circular rice paper sheet. Other names are Summer Rolls, Rice Paper Rolls, Crystal Rolls, or Fresh Rolls depending on where you live. In South Vietnam they are known as Gỏi cuốn while they are called Nem cuốn in the Northern parts of Vietnam. They should never be call Spring Rolls as they could be confused with the deep fried version. What Ingredients Are In Salad Rolls? Fresh filling usually consist of pickled carrots, lettuce, bean sprouts, shrimp, Thai basil (mint), and spring onions. 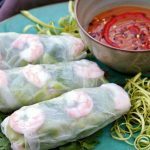 Salad Rolls always contain rice vermicelli and usually a protein such as shrimp, sliced porks, sliced pork sausage, stir fried seafood, beef slices, or egg. However, salad rolls are great with crispy tofu or just with fresh vegetables. They can be served with Peanut Dipping Sauce (below) or with Nước chấm. The two most important things to master when making Salad Rolls are soaking the rice paper and perfecting the rolling tecnique. Fill a large basin with about 2 inches of hot water. Soak the wrappers until they have softened, then lay flat on a moistened surface (like a granite or marble counter top). Note: the wrappers will stick to wood like crazy. Arrange shrimp halves and basil leaves near the bottom 1/3 of the wrapper, then cover with lettuce. Pro tip: use butter lettuce, it acts as a ‘shield’ or a second wrapper so the ingredients don’t poke through. Pile the other ingredients vertically over top of the lettuce. Begin wrapping by folding the edge nearest your body upward, then fold in the sides. Continue rolling in an upright manner. Cover the rolls loosely with plastic wrap or they will dry out and become tough. How Long Do Salad Rolls Last? For best results, eat the Salad Rolls fresh off the assembly line. To store, wrap the rolls tightly in plastic wrap and place in fridge for up to one day. If the rice paper dries out, mist them slightly and allow the moisture to absorb before serving. These Vietnamese Rice Paper Rolls are so fresh and healthy. They're easier to make than you think...you'll be rolling in no time! Served with a completely addictive authentic peanut dipping sauce. For the carrots, peel them then cut into matchsticks. Place in a small bowl or jar with 2 teaspoons salt, 2 tablespoons white sugar, ¼ cup rice wine vinegar, 1 tablespoon lime juice, ¾ cup boiling water. Allow salt and sugar to dissolve. Let carrots pickle for at least an hour, preferably overnight and up to one week. Prep all your ingredients BEFORE you start assembling your salad rolls. To assemble salad rolls begin by filling a shallow tray with warm water. Carefully dip one rice paper round in the water until it is just softened. Focus on keeping the rice paper from crumpling or tearing and lay on a slightly moistened counter top or smooth surface. 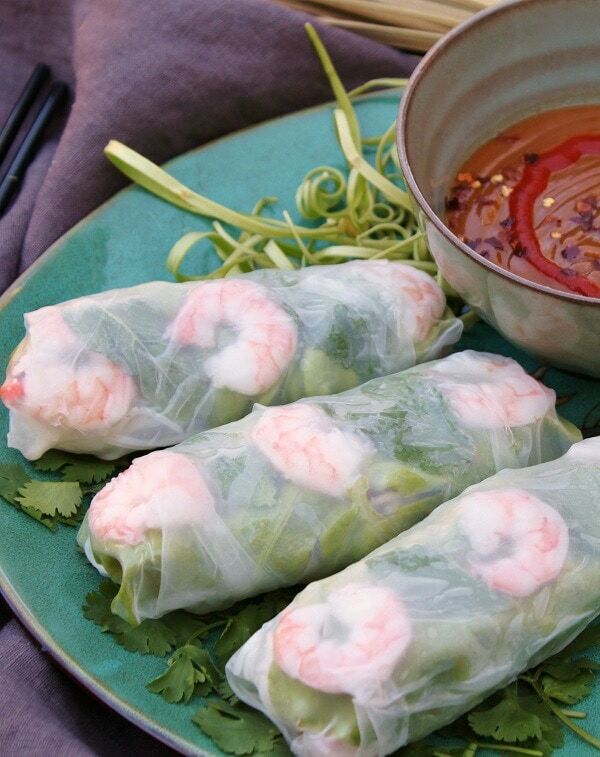 Place shrimp halves and basil in a pattern on the lower half of the rice paper, then lay a lettuce leaf over top. Ensure there is enough rice paper peeking out so that you can fold it over the fresh fillings. Place a small amount of vermicelli noodles, sprouts, pickled carrots and a spring onion over top the lettuce leaf. Curl the bottom of the rice paper round over the lettuce leaf, tuck the sides over and roll in an upward direction until the entire rice paper round has been rolled over the fillings. 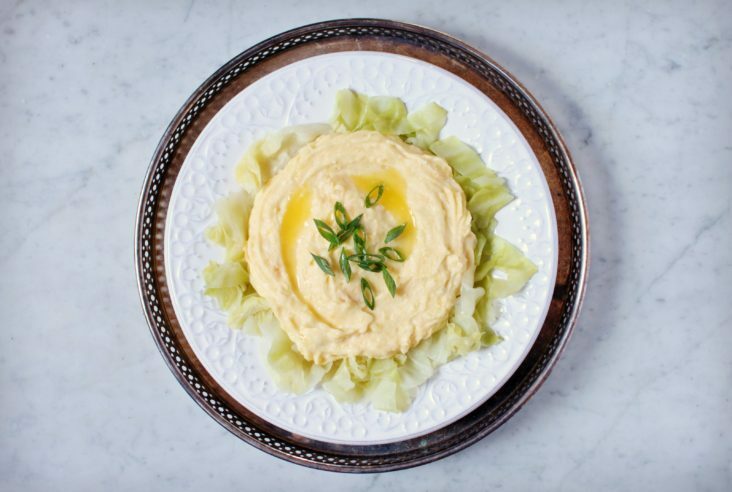 Place on a platter and repeat until the rest are rolled. If not eating immediately, cover tightly with cling wrap before refrigeration. 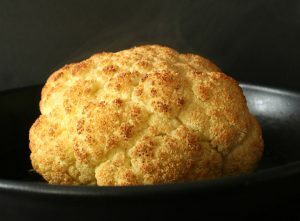 Serve with Hoisin Peanut Butter Dipping Sauce. Add all ingredients to a bowl and mix well. Add chili sauce (or chili flakes) to taste.